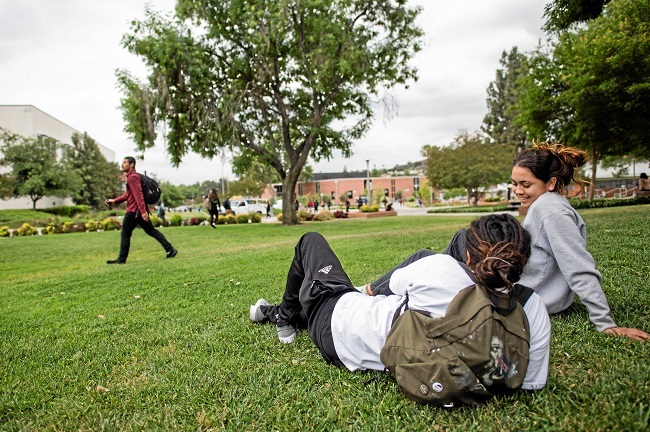 Mount San Antonio College plans to cut its water usage in half over the next decade, saving 32.5 million gallons a year. With Gov. Jerry Brown’s mandatory water cuts, Mt. SAC is moving forward with conservation plans to cut its $350,000 a year water bill. The campus plans to increase the amount of recycled water it uses by drilling two new wells. It will also begin to replace grass and other water intensive plants with drought-resistant species. “We have to ask ourselves, ‘Do we have too much green space?’” said Michael Gregoryk, vice president of administrative services. Artificial surfaces are already scheduled for the athletic practice fields, which cover almost four football fields. Work begins in December. Nellesen pointed to the plants native to California used around the new Design Technology Building as a good example of future landscaping. “We’re not ripping out lawns where students gather, but grassy areas like the corner of Temple and Grand. That’s just there for appearances,” Nellesen said.